It’s hard to visit Albuquerque and not think about Breaking Bad. After all this hit TV series about a chemistry teacher turned meth cook was filmed here. Breaking Bad is big business in Albuquerque these days, as I’ve seen everything from a postcard with Walter’s drivers license on it, to the incredibly popular Breaking Bad Balloon Fiesta pin here. The latter sold out in 15 minutes, but you can still order one online from the Plano Pin Company. With all this Breaking Bad hoopla it would seem a sin not to indulge just a bit; which why I decided to do a little research and create my own Breaking Bad Driving Tour. In the end I was very pleased, as not only is the tour free, but it’s also wheelchair-accessible. Best of all, you can do it at your own pace. 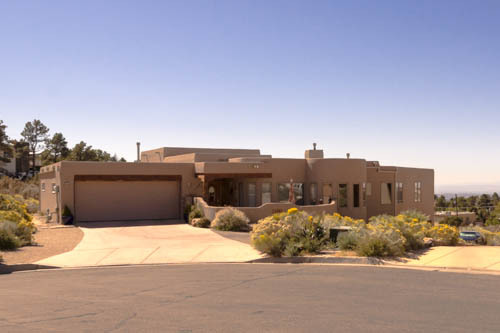 My little tour started at Hank and Marie’s house, which is located at 4901 Cumbre Del Sur Ct. It’s located on a small cul-de-sac, and if you’ve ever watched the series, you can spot Hank and Marie’s house as soon as you make the turn. I was surprised that it was so quiet, although we did see a silver Mustang that looked like it was also on a driving tour. After a short stop for a few snaps we were on our way. The next stop was at a shopping center, located just up at road at 9800 Montgomery Blvd., NE. At first we were kind of at a loss as there wasn’t a clear consensus which of these storefronts was the location of Sal Goodman’s office. Then the silver Mustang pulled in the parking, and they started talking with a man in a truck. I decided they were in search of the same thing as we were, so I went over to consult with them. Turns out that the man in the truck was the authority on the subject, as he was there for the filming. 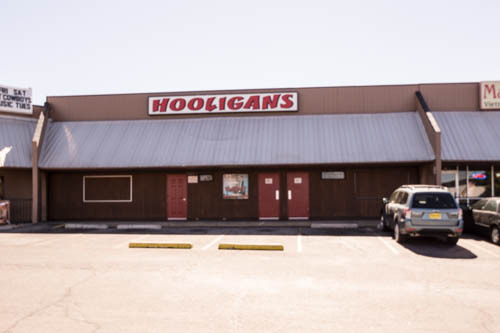 Holligans was the location site, and I could visualize it, even without with all of the scheister’s patriotic trappings. Next it was off to Walter’s house, which was located in a non-descript neighborhood just a short drive away at 3828 Piermont Dr., NE. Again, the silver Mustang was there, along with a whole new contingent of Breaking Bad fans. They all seemed to want to have their photo taken in the driveway, and soon the owner came out and told folks that they had to remain in the street. I subsequently found out that the homeowner was well paid by the production company for the exterior shots, so I didn’t really feel too bad for her. Plus she seemed to be basking in her 15 minutes of fame, as she proudly posed by her mailbox. Her main concern seemed to be that there would be enough parking for all of the fans. 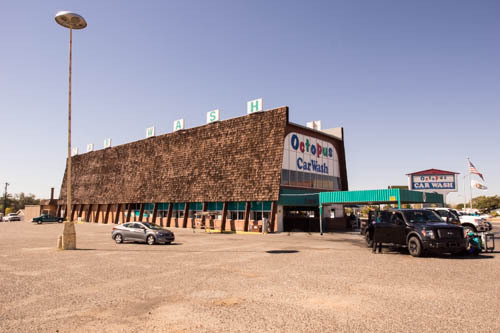 Of course, no Breaking Bad tour would be complete without a stop at the car wash, which is located at 9516 Snow Heights Circle. Its called the Octopus Car Wash, and again, if you’ve ever watched the show, you can spot it from afar. I also ran into an enterprising young man (Jessie) here, who was selling copies of the Albuquerque Journal that contained Walt’s obituary. 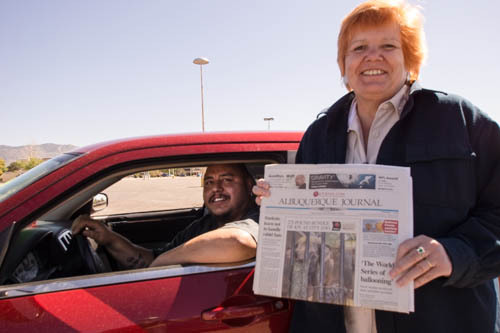 He works as a handyman and hot tub installer, and when the Journal printed the obituary, he thought it would be a good idea to stock up on them, so he hit the newspaper machines after work and purchased as many copies as he could. Apparently his hunch paid off, as the same newspapers are going for $50 on EBay. He sells them for $20, and if you take the time to chat with him, he might even show you some photos of the cast. Apparently he followed the filming as much as possible. Anyway, it’s a fun stop, and Jessie (yes that’s his real name) added some dimension to it. 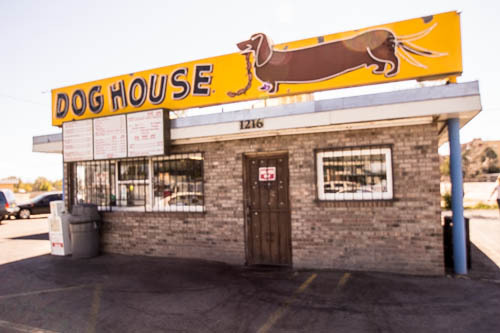 Next up was the Dog House, where Jessie purchased a gun in the second season. You’ll recognize the facade straight away, but hold off on eating till the next (and last) stop – the location site for Los Pollos Hermanos. Located at 4257 Isletta Blvd., this Twisters restaurant is a required stop on any Breaking Bad tour. This is another site you’ll recognize from the outside; however save some time to check out the inside too. 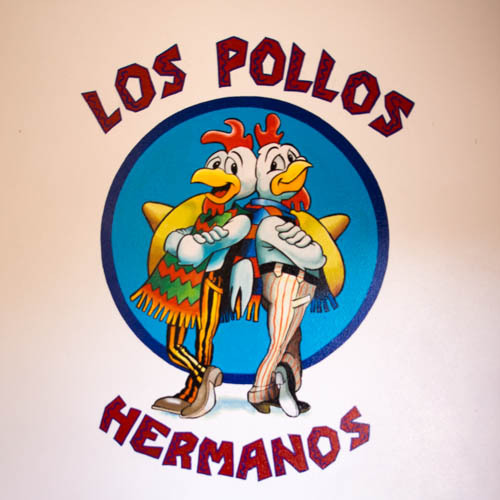 Not only do they serve up a decent bowl of green chili stew, but you’ll also find the Los Pollos Hermanos logo just inside the front door. 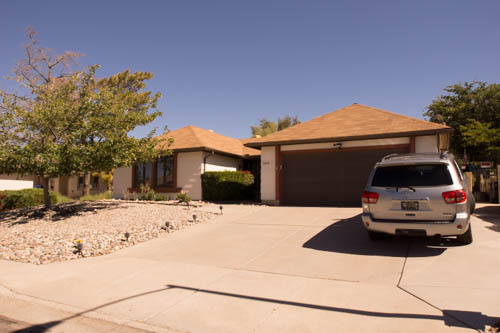 And if you are in doubt, there is a sign on the wall stating that this is the place where Breaking Bad was filmed. The staff seemed oblivious to the influx of Breaking Bad fans, and there’s even a guest book to sign on the front counter. 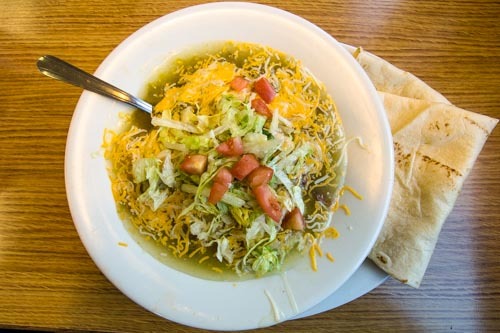 The green chili stew at Twisters is pretty darnd good! All in all it was a fun little tour, and although we didn’t hit all the Breaking Bad location sites, we found many of the major ones. To be honest, seeing the sites was fun, but it was also a hoot to interact with other fans. It’s not the only thing to do in Albuquerque, but it does add another dimension to the city. And like I said, it’s just plain fun! This entry was posted in Uncategorized and tagged accessible travel, Albuquerque, Breaking Bad, car wash, Dog House, filming sites, Hank's House, Los Pollos Hermanos, slow walkers, tour, Walter's house, wheelchair by Candy B. Harrington. Bookmark the permalink.